My Secret Valentine Exchange swap 2108. Time has really run away from me just lately and I have just realised that I did not blog about my Secret Valentine Swap experience last month. So, for those who are unfamiliar, this is a friendly crafting swap, organised by the amazing Sanae and Ute and I understand that this is the fifth year of it taking place. The idea is that you secretly make a handmade gift for your assigned partner, to be sent out in time for Valentines Day. You will also receive a handmade gift from another partner. Such a lovely idea. I chose to sew my items, but any craft that you are into is acceptable. Some knit, some paint, some crochet, some wood turn and others have made jewellery, to name but a few. I imagine pretty much every craft has been covered by this exchange. In order to help you make something for somebody who is essentially a stranger, you answer a couple of short questions regarding your taste and style, and this information will be passed to your partner. You will also be given their social media information so that you can take a little peek to see if this helps you make up your mind on what to make for them. I think the idea is to use bits and pieces that you already have where possible, to try to keep your costs down. Ooh and it is an International event so you may receive or have to send your item abroad. This is the second year that I have taken part and I loved it so much last year that I couldn’t wait to take part again this time. They lady who I made for lives in the U.K. I will not link her here, as I have not asked for her permission, but I had a little peek over at her Instagram to see if this would give me any clues as to what she might find useful. I must admit, nothing jumped out at me, so to play it safe I decided to make her a fabric basket, as I have made a couple of these for myself before and I think they are super cute as well as very useful. I knew that her colour preferences were blue ( which is lucky as anybody who knows me will know that I wear lots of blue – therefore meaning I have lots of spare blue fabric), and I made a large quilted basket. This was pretty quick to make, and I felt like I could do more. So I also decided to make a smaller bag, made up with small patchwork pieces to add to gift her too. Again it is a bag that I have made before and I use it to keep my Clover Wonder Clips in. The bag came together really nicely and I also bought some Wonder Clips for her in case she might like to keep some in her bag too! Finally I raided my felt stash, and cut several different shades of blue felt into circles to stitch together to make some felt bunting. I was excited to package it up and send it off to London in time for Valentines Day. So the gift that I received bowled me over! Again I won’t mention her as I haven’t her permission, but I received the most beautiful Seamwork Almada robe from my lovely partner. I cannot tell you how beautiful it is. My clever partner has chosen something that I will treasure and truly love wearing. The fabric is super soft and the colours are right up my street. I cannot believe that somebody would make something so lovely for me, and am truly moved by such kindness. If you are active on Instagram, you might want to take a look at the hashtag #2018sve and check out all the wonderful items that were given and made during this wonderful exchange. I believe that there were 576 participants worldwide this year which is incredible! I think this is a great way to share your love of craft, with like-minded individuals. Thank you so much to Sanae and Ute for organising such a huge event. It really is fabulous. It is also a great way to make new friends. I now have two new sewing friends (alongside the two new sewing friends that I made with last years swap). I ate too much chocolate this Christmas. It’s a fact. This January, therefore, I shall be walking lots and lots. There is nothing better when you come in from the cold outside than a great big cup of steaming hot coffee. 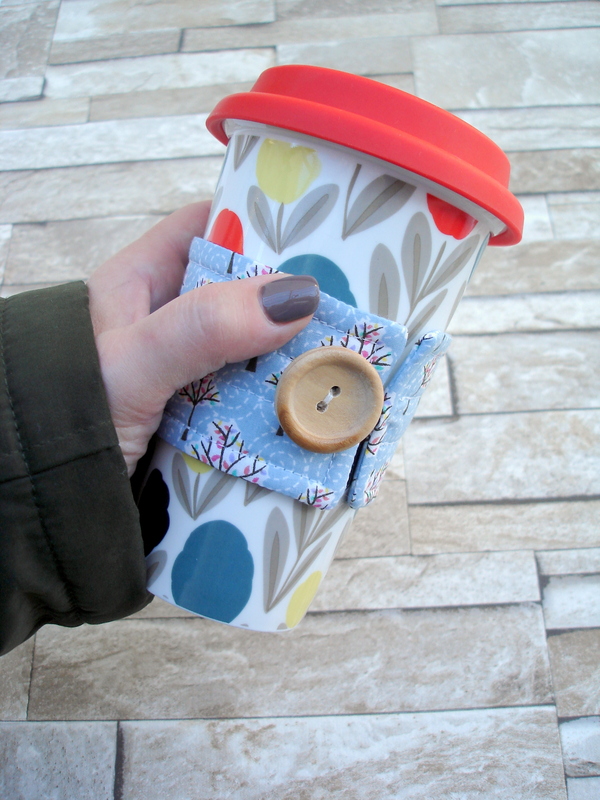 Now that many coffee shops will charge you less for your coffee if you provide your own reusable cup, I reckon we can cut down on paper waste even more by making our own fabric sleeves too! So much prettier than the cardboard version and environmentally friendly too. 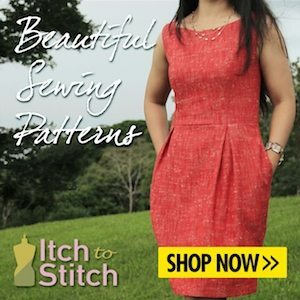 You will need a sewing machine to make this but it is super simple so is a rewarding project for an experienced sewist, but at the same time very satisfying for a beginner sewist too. Before you start you need to make sure that the cardboard coffee sleeve that you have picked up to use as a template fits the cup that you are making it for. This is a perfect fit. You will then need to peel open the cardboard sleeve and lay it on some paper and draw around it to make a template. I drew around mine and also added a 1/4″ seam allowance all the way around. Just to mention that this sleeve had no overlap so I knew that my finished fabric sleeve would meet edge to edge. I prefer this as there is no bulky lump of fabric where it overlaps a little, but if you prefer an overlap go ahead and simply add a little more length when you are cutting out. You can now cut around the line you have drawn using paper scissors. Now that we have a template we can cut out our fabrics and wadding. Make sure your fabrics are pressed and free from any creases. I pinned and cut out two matching pieces of pretty cotton fabric for the outside and inside of the sleeve. If you prefer you could use a different fabric for the inside piece, making it reversible. As I was using a directional print I was careful to place the template so that it was not upside down! It is also important to flip over the template when you are cutting your second piece so that it is exactly opposite to the first one. I also pinned and cut one piece of wadding from this template. Time to make a fabric sandwich! Place the wadding on the bottom, then place both pieces of pretty fabric on top of that – the pretty fabrics need to be placed right sides together. Pin this in place. Before we sew this together we need to insert the button loop (hair tie). Measure how large the loop needs to be by slipping it around the button and either sew a few stitches in it to keep it in place or wrap a thread around it a few times and tie it off. You need to do this or the hair tie won’t stay closed when you are sewing it together and it will look untidy. In my case, the smaller loop will be the loop which goes around the button. Remove a pin or two from one end of the fabrics which you just pinned together and insert the hair tie with the loop that is needed to go around the button inside the two layers of pretty fabrics. In my case the larger loop that is not needed will be sticking out. Also remember that the stitches where you have kept the hair tie closed together need to lie along the line of your seam allowance. As I am using a 1/4″ seam allowance I was careful to place the threads of my hand stitching on the hair tie 1/4″ in from the edge of the fabric. Re-pin this edge closed again and we are ready to take it to the machine. In order that we can turn it right side out again when we have finished sewing around the edges I will leave a gap of approx 2″ along the bottom edge of the sleeve. Simply sew around the edges (leaving a 2″ gap along the bottom edge) using your chosen seam allowance (in my case 1/4″). Back stitch a few stitches at the start and finish so that your seam doesn’t pull open when you are turning it right side out. Stitch slowly when going over the hair tie. You may also like to backstitch over this area for extra strength. Snip all 4 corner points to make it less bulky – don’t clip too close to your stitches though! You can also trim back the hair elastic (not shown on this picture) so that you aren’t left with this bulk inside your sleeve. Turn the sleeve right side out now. Use your point turner, knitting needle,chopstick or similar to push into the corners to make the points sharp. Take to the ironing board and give it a good press ensuring the raw edges of the opening are turned neatly inside. Again take to the sewing machine and neatly sew a line of stitching 1/4″ all the way around all four edges. This should catch in the opening that you had at the bottom so that the sleeve is totally enclosed now. If you have quilting skills now is the time to show them and go ahead and make those fancy free motion patterns that I so admire. I, however, do not possess such skills and therefore chose to sew a couple of neat horizontal lines following the curves of the long edges. At this point you will want to give your sleeve another good press. Place the sleeve around the cup and work out where you need your button placement to be. Hand stitch this in place. That’s it, you’re done! So easy and so so quick. Do you have a ‘coffeeholic’ in your life that you could make this for? Or would you treat yourself to this? It is a great unisex gift idea – you could really personalise your gift with fabric relevant to the recipient, maybe it could be a little extra present to give along with a coffee gift card? If you were wondering, the coffee cup here is from www.lauraashley.com (a couple of years back), and the pretty fabric used was from a fat quarter bundle purchased from www.hobbycraft.co.uk a couple of months ago. I do hope you have enjoyed this quick tutorial. As always I would love to hear if you have made one of these. Wishing you all a very happy new year, stay warm and enjoy your coffee! Don’t panic, it’s nearly Christmas and you’re looking for a quick last minute gift idea – I’ve got your back. 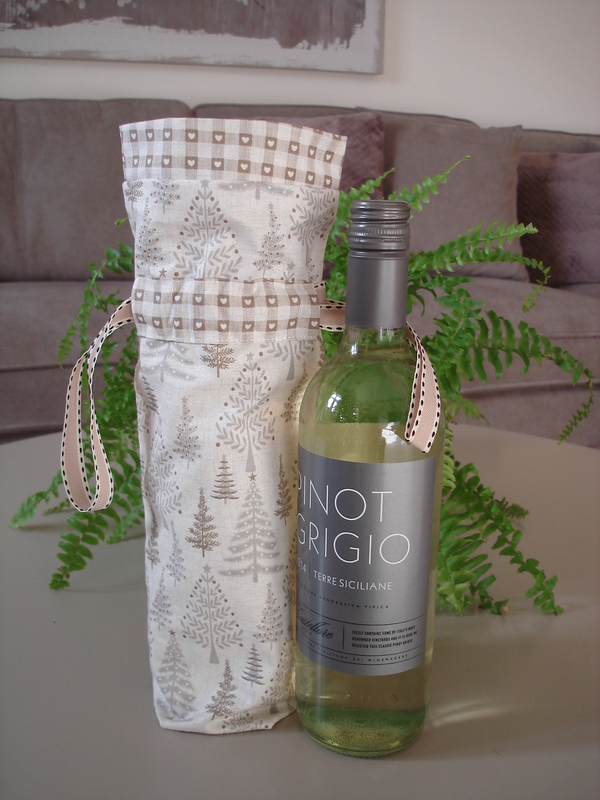 This is such a pretty and thoughtful way to gift a bottle of wine, it takes very little time to whip up and you may well have enough fabric in your left over stash pile without buying any more. I have made it with 2 fat quarters of Makower Christmas fabric from their Scandi collection but it is perfect using any fabric you like for whatever occasion you need a bottle of wine for! Firstly take your 2 small pieces of fabric which are going to be the casing which the ribbon is threaded through and press a 1/4″ hem all the way around on the wrong side of the fabric. You’ll need to do this with both pieces. Pin one of the casings on to the right side of one of the outside fabric pieces. I placed it so that the top of the casing was about 2 1/2″ below the top edge of the fabric piece. Repeat for the other casing on the remaining outside fabric piece. 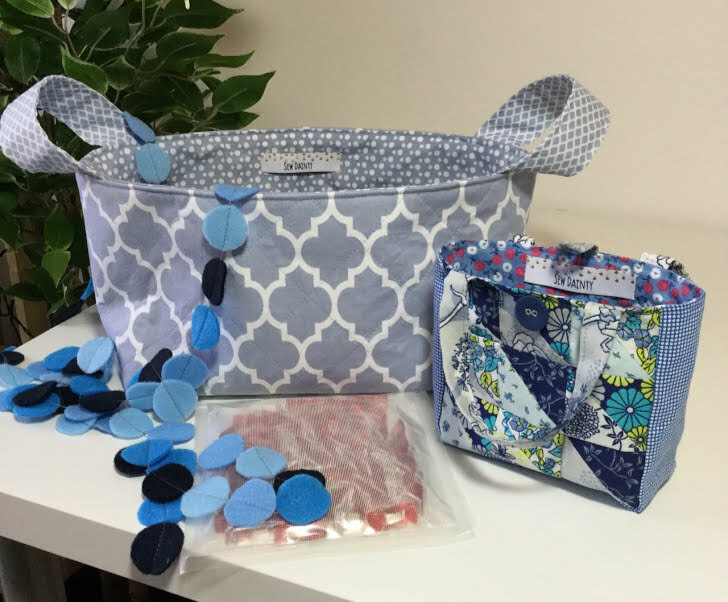 Take both of your fabric pieces to the sewing machine and sew along the top and bottom long edges of the casings, leaving the short ends open so that the ribbon may be threaded through later. Next place the two outside fabric pieces with the right sides together, pin, and starting at the top, stitch down one long edge, along the bottom, and up the other long edge. The top edge should remain open. I used a 1/2″ seam allowance for this. Take care if you are using a directional fabric that it is laying in the right direction! Repeat this step with the lining fabric pieces. Pin them with the right sides together and stitch from the top down one long edge, along one short edge and back up the other long edge. Again you should have one short edge left unstitched. If your fabric isn’t directional then it doesn’t matter which way up it is when you stitch it, but if it has a directional pattern like mine then you will need to stitch the three edges so that when it is attached to the outside bag and pulled through,the turnover will be the right way up. This only applies to the lining bag – it almost feels like you are sewing it upside down – but trust me when it is finished the one inch band at the top will be the correct way up! Although not the best photo, above shows both outside and inside bag stitched around three edges. Although the wrong sides of the bags are shown you may notice that the lining bag (with the little heart pattern) is ‘upside down’. As explained this means that when it is stitched to the outer bag and turned through the pattern will show the right way up! The next step is to give the bottom of the bags some shape so that they will sit nicely. Pinch open one end of the bottom of one of the bags so that you have a triangular shape. Measure down 1 1/2″ from the point and draw a line across with a pen or pencil. Pin it in place, and repeat with the other 3 corners. 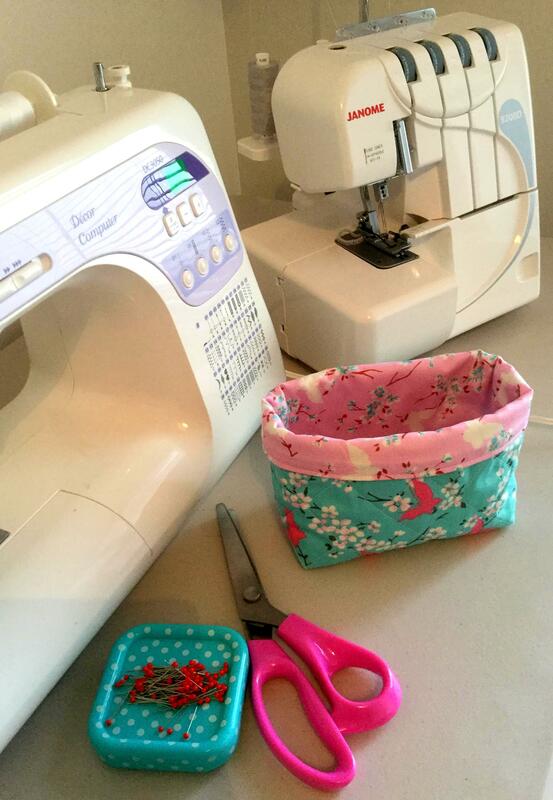 Take your bags to the sewing machine and stitch along the lines you have just drawn. When all 4 points have been sewn, trim the edges. The bottom of both bags should now have a bit of shape. This is the fun bit. Turn the lining bag right sides out now. Place it inside the outside bag so that the bags are inside each other with their right sides together. Make sure you match up the side seams. Pin into place. Again using a 1/2″ seam allowance stitch around this open edge leaving a gap of approx 2″ so that you can turn it through to the right side. You will probably need to remove the extension table on your sewing machine and just use the free arm as this opening is quite small. When you have done this turn it inside out through the opening you have left and take it to the ironing board and give it a good press. You should be left with a neat little 1″ band around the top of the bag. If you feel that topstitching the top of the bag will help keep it’s shape then go for it! Thread your needle and sew the little opening closed with neat small stitches. Time to thread the ribbon, starting from the right side of the bag thread the ribbon through the casing to the left side, take it around to the back and thread through the casing back through to the right side of the bag again. Repeat with the other piece of ribbon but starting at the left side of the bag and threading it the opposite way around to what you did before. I used my fancy new ‘elastic glides’ from Hemline for this but you could simply attach a safety pin and thread it through using that too. Take care not to twist the ribbon, it will look much better if it lays flat in the casing. I hope you have enjoyed this blog post, I think it makes that boring bottle of wine so much more special. Let me know if you give it a go! Now that November is here it really is feeling cold outside. Last weekend after watching my youngest son play football on a very cold field in Leicester, I couldn’t feel my fingers and decided to do something about it. 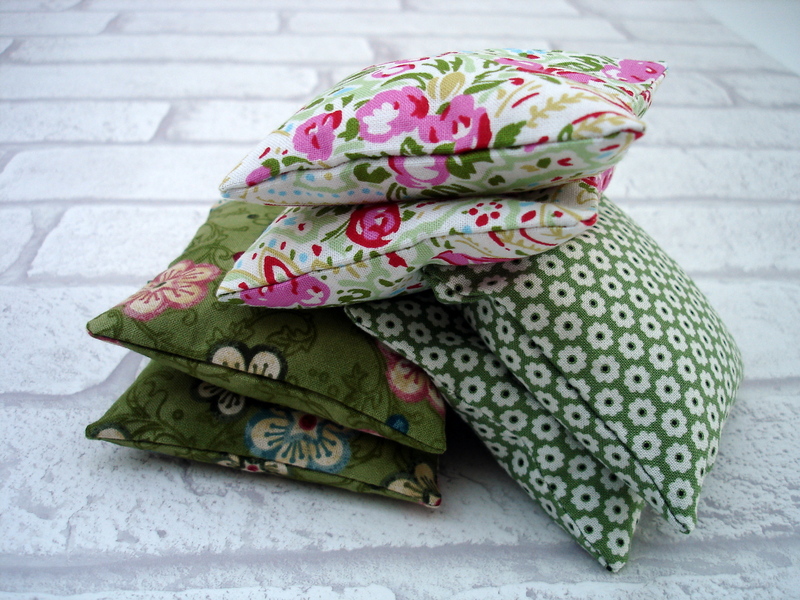 These cute hand warmers are super quick and simple to make, and use very little fabric so are great for using up those little scraps of fabric we all have lying around. They heat up in the microwave in no time at all so are perfect to grab on your way out in the cold. Start by cutting your fabric into squares. I used a rotary cutter and mat but if you don’t have this just carefully mark out your square on the reverse side of the fabric and cut out. For each pair of hand warmers you will need 4 squares. Take 2 of the squares and pin them together with the right sides of the fabric facing together. Take this to your sewing machine and stitch around 4 sides remembering to leave a gap on one of the sides of about 1.5″ so that you can turn it through to the right side. 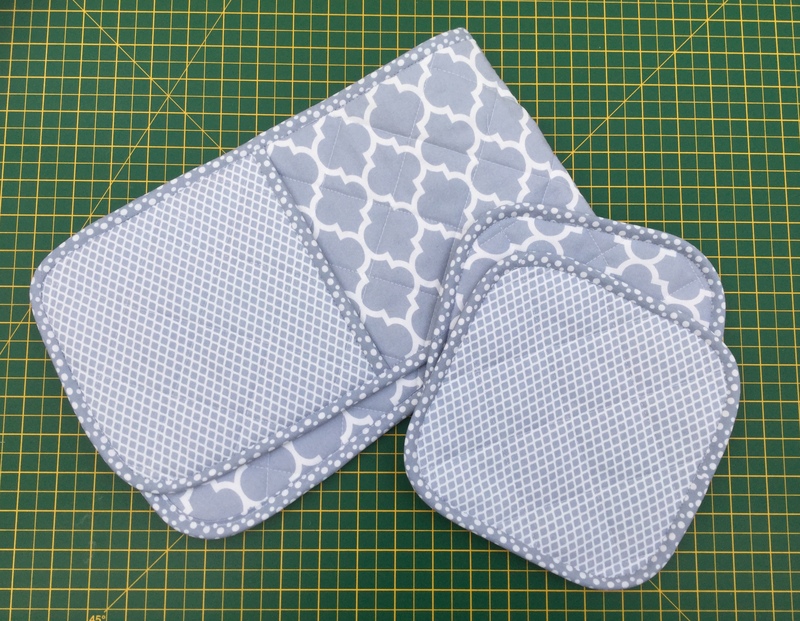 I used a seam allowance of about 1/4″ Make sure that you backstitch a couple of stitches at the opening that you have made so that it is nice and strong and your stitches won’t rip. Snip all 4 corners diagonally. Not too close to the stitching. Turn your bag the right side out now. Gently push the corners out so that they are nice and sharp – you can use a point turner for this or if you don’t have one you could use a knitting needle, chopstick, or something similar. I like to give it a press with the iron too as this helps when you are closing up the opening later. Now it’s time to fill with rice. I would suggest to fill it about 3/4 full. I used a little funnel that I had already but you could use a funnel that you have made yourself using rolled up paper. Time to close the opening now. I decided to hand sew mine closed using ladder stitch (slip stitch). I know this takes a little more effort and time but I love the invisible finish it gives and I think it looks much neater. You can of course use your machine to close up your bag, simply sew your edges together as close to the edge as you can. Take care not to catch any of the rice grains as you go as they may snap your needle! There you have it! To warm them up just pop them into your microwave for 30-45 seconds and you’re good to go! I love how easy and quick these are to make, it’s difficult to stop at just one pair. Perhaps you could add a couple of drops of your favourite essential oil to your rice? You could also make them up in larger sizes and use them for your neck or feet. If you want to use them as a cool bag simply place inside a freezer safe ziplock bag and freeze. They are a great unisex gift idea maybe for a teacher or a dog walker, neighbour, friend or just to slip in your childs pocket on the way to school. I hope you like these sweet little hand warmers. Let me know what you think, I would love to hear from you. Have you made or received some hand warmers like these?